In Snyder v. Phelps, the Supreme Court held that the Westboro Baptist Church had a First Amendment right to picket the funeral of a young soldier killed in Iraq. This decision reinforces a position that has become increasingly prevalent in First Amendment jurisprudence – the view that the state may not regulate public discourse to protect individuals from emotional or dignitary injury. In this Article, I argue that this view is deeply problematic for two reasons: it unduly sacrifices the value of individual personality and it tends to undermine the sphere of public discourse itself by negating the practical and normative conditions on which it depends. I then present an alternative theory of the First Amendment which holds that the same values of human dignity and autonomy that support freedom of speech also give rise to other fundamental rights. Thus, speakers generally should have a duty to respect the personality and rights of others. Drawing extensively on the record in Snyder and other materials, I argue that the First Amendment should not protect Westboro’s funeral picketing because it is intended to condemn the deceased and to inflict severe distress on the mourners in violation of their rights to privacy, dignity, and emotional well-being. Finally, I show that while Westboro prevailed in Snyder, this may prove to be a Pyrrhic victory, for the Court also suggested that states can protect mourners through carefully drawn buffer-zone laws. 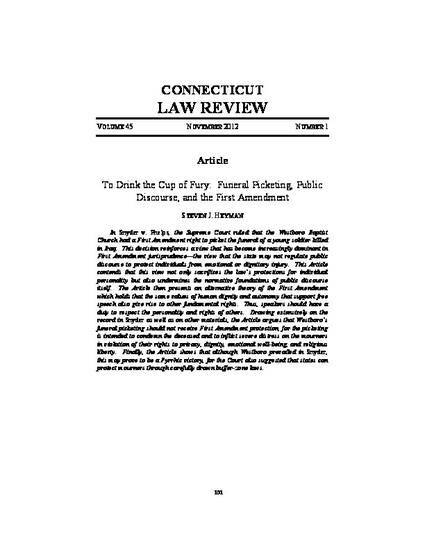 To Drink the Cup of Fury: Funeral Picketing, Public Discourse and the First Amendment, 45 Connecticut Law Review 101 (2012).